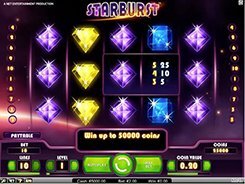 Starburst is a 5-reel 10-payline video slot released by NetEnt. 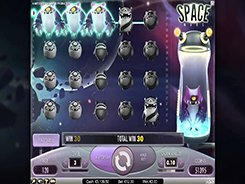 An array of gems, bars and sevens used in the game give it a strong classic twist, while very detailed graphics and bright visuals make the slot incredibly modern. 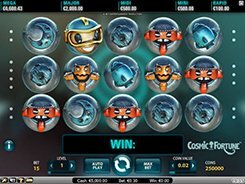 The slot offers an option to adjust three bet settings: a coin value, the number of coins and the number of active bet lines, so your minimum and maximum stakes are $0.01 and $100 respectively. 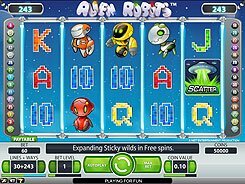 All winning combos you form on the reels pay from left to right AND right to left. 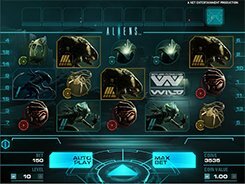 The biggest payers in the game are Bar and Seven symbols; these pay out $2500 and $1200 accordingly, for five of a kind. A wild symbol that only lands on reels 2, 3 and 4 is depicted by the Star. Whenever the Star appears, it expands making the entire reel wild and activates a free respin. During a respin, the wild reel stays locked in its position for an increased chance for creating a winning combo as soon as the reels come to a stop. 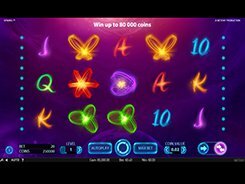 Overall, Starburst is a simple-to-play game with decent regular payouts and a lucrative respin feature that makes your wins even bigger.